Understanding where volcanoes come from and how they form is an important part of understanding their impact on human civilization and the environment. This map depicts some of Earth's major active and extinct volcanoes. Why do volcanoes form where they do? Is there a connection between the location of extinct volcanoes and active volcanoes? 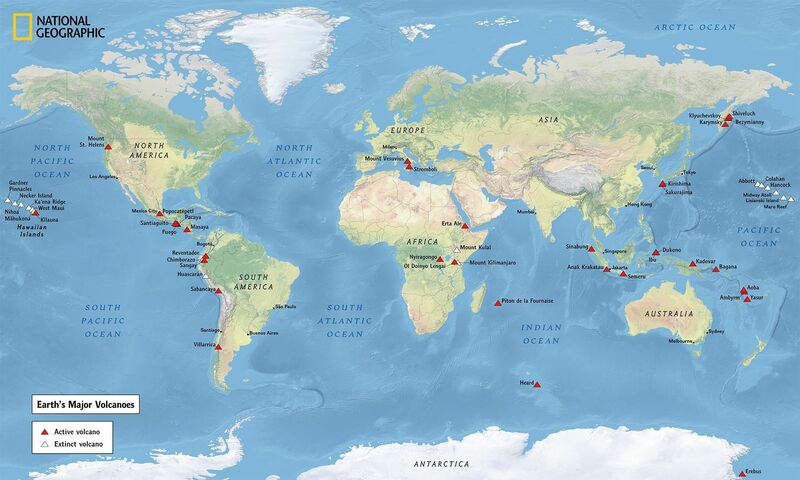 Use the Earth’s Major Volcanoes map to explore these ideas. Prepare students by reviewing the sources of volcanism, namely, hotspots in the mantle and plate tectonics. Explain that hotspots are not stable and do not remain at the same location at all times. Additionally, students should understand how plates move over time and the effects of this movement. Have students identify the likely source of volcanism for each active volcano on the map. Then, have students compare the locations of the active volcanoes to the extinct volcanoes. Ask them to consider why the extinct volcanoes tend to be close to the active volcanoes. Given what they know about the active volcanoes, have students identify the past source of the extinct volcano. To extend this activity, have students research and plot the locations of the other volcanoes in the Hawaiian-Emperor seamount chain. Ask students: Do you think that this chain comes from a hotspot in the mantle or plate tectonics? How would you explain the bend in the chain? underwater mountain range in the north Pacific Ocean, stretching from the U.S. state of Hawaii to southeast Japan.